South Korean petroleum refining company SK Innovation has successfully discovered crude oil at a Chinese block in the South China Sea, the company said Thursday. According to the company, it found a 34.8-meter-thick effective oil pool at Block 17/03 located at a depth of some 2,000 meters down the Pearl River Mouth Basin in December last year. This marks SK Innovation’s first discovery in the area since it began an offshore oil exploration project in 2015 as an operator in the South China Sea. 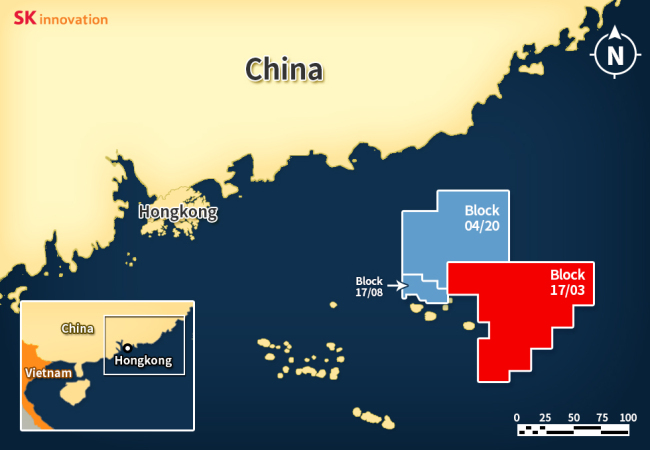 SK Innovation currently owns 80 percent of the block, while the rest is held by China National Offshore Oil Corporation, a Chinese state-owned company that specializes in offshore oil and gas. “This significant achievement was possible due to our 36 years of technical expertise,” said the company. During the test production period, the company said it drilled up to 3,750 barrels of crude oil a day, solely based on the natural pressure from the geological strata. SK Innovation said it plans to conduct an evaluation to further verify the oil reserves and commercial value of the block. If the value is verified, the company will set up an oil production platform in the South China Sea. “SK Innovation is the first private company in Korea to pioneer the upstream oil and gas business. Once the commerciality of the project in PRMB is secured, SK Innovation will use it as a platform for expansion to other areas in the South China Sea,” said a SK Innovation spokesman. Since 1983, the company has been producing conventional oil in Peru, Vietnam and the Middle East. It currently produces a daily average of 55,000 barrels of oil equivalent in 13 blocks in nine countries around the world.